Po’olenalena Beach in Wailea is an ideal beach for sunset photo sessions at any time of the year. The sun will always set behind this beach, and there are many beautiful features on this beach that make for spectacular photos! People come to Maui for the beauty, particularly the spectacular beaches, but most tourists don’t know which ones are the best, especially when it comes to doing a professional photo session. So not surprisingly, one of the most-asked questions I get when booking people for a photo session is, “How do I choose a location? !” With so many options, it may seem difficult to narrow down. After living here for 14 years though, I’ve become pretty familiar with most of the beaches on Maui and also know there are some limitations to where commercial photographers are allowed to shoot. So listed below are my five favorite beaches for photo sessions where I am allowed to shoot. 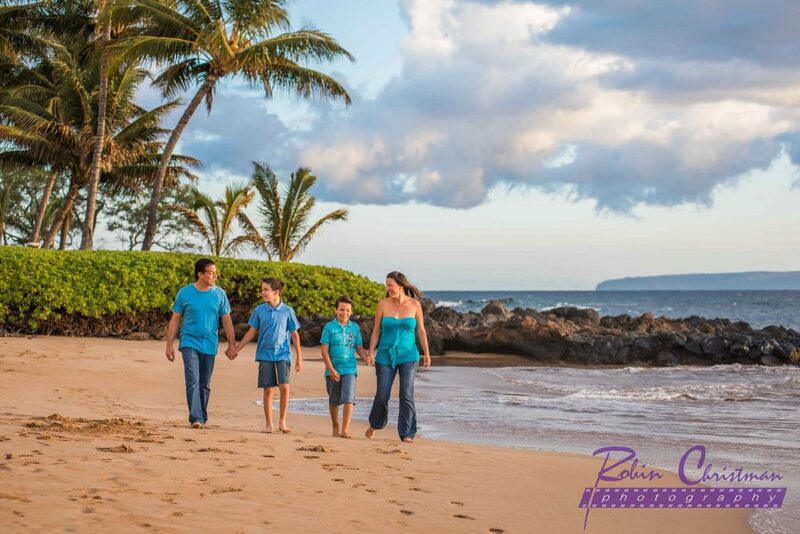 The Simon family chose Po’olenalena Beach in Wailea for their sunset photo session. There are a lot of beautiful wind-swept trees at this spot which are great for photo backgrounds and for kids to climb on! My absolute favorite beach is Po’olenalena Beach in Wailea. Locals refer to it as Chang’s Beach. This beach is located on the south side of the island and faces west. It is the perfect location for sunset photo sessions because no matter what time of year it is, the sun is always behind you at this beach. Throughout the year the sun moves north or south so some of the westside beaches don’t actually have the sun behind them at certain times of year. Po’olenalena is my go-to spot for most sessions. It is also a very large beach with many options for backdrops that don’t get redundant in a photo session. There is a beautiful wooded area to the left of the entrance that makes for spectacular photos. There is also lava rock on that end. To the right is more lava rock, great for posing people on, and some tall palm trees that make a nice backdrop when standing in the middle of the beach. Looking out from the beach is a view of Molokini Crater and Kaho’olawe which is a small deserted island a few miles from Maui. There is also a view of the West Maui mountains. There is more hidden beach to the right which can be reached within minutes but you must hike along the rocky path that wraps around the point. Definitely not easily accessible for folks with mobility issues but worth the hike for those who are willing and able. On that side are all sorts of nooks and crannies, palm trees and lava rock. There really are endless possibilities at this beach! Unfortunately there is no bathroom with running water, but there is a port-a-potty. There is also not a place to wash the sand from your feet after the session. There is a nice large parking lot at this beach. *Morning sessions work at this beach if scheduled early enough. With the ocean behind you, the sun will be in your face by 8:30am (that time changes depending on time of year). Click here to view a sunset vow renewal at Po’olenalena Beach. Click here to view a morning beach wedding at Po’olenalena Beach. The Caroso family chose a morning session at Baldwin Beach in Paia which is a beautiful light-sand beach that showcases the blue sky and crystal clear blue water. Baldwin Beach is a favorite of mine for morning photo sessions. This is a north shore beach so it is perfect in the morning because you don’t have the sun facing directly in your face when the ocean is behind you. This is also a very large light-sand beach with many options for backdrops, beautiful blue sky and clear blue water. There are lots of trees and foliage at the perimeter of the beach and some fun things like a tire swing just to the left of the entrance. You will often find large pieces of driftwood here, too, which makes for a nice prop in the photos! There is plenty of parking at this beach, bathroom facilities and a shower to rinse your feet. This beach is located in the colorful hippie/surfer town of Paia so you could go into town after the session and have breakfast at one of the many quaint restaurants and then do some souvenir shopping after breakfast. My favorite restaurant for breakfast is Cafe Des Amis! *This beach is not recommended for a sunset photo session. You can check out my blog post of a morning session at Baldwin Beach here. Baldwin Beach has a tire swing that is a fun photo prop for kids! The Pillow family chose Oneloa beach, also known as Ironwoods Beach, for their family photo session. This beach is one of my favorite locations on the westside for sunset sessions. Oneloa Beach is more commonly known as Ironwoods Beach. It is a beautiful white-sand beach located on the island’s westside(Lahaina, Honokowai, Napili, Kahana, Kapalua). This is one of my favorite beaches on that side. The sun does not always set directly behind this beach, but it still has spectacular skies and gorgeous views. Lava rock flanks both sides of this beach, and the island of Lanai is directly in front of it. This beach can be pretty windy so not ideal for people who are super particular about their hair. There are no bathroom facilities here, however, there is a shower for rinsing your feet after the session. There is very limited parking at this location. This beach also requires a special permit which has to be applied for at least 5 days before the session. *This beach can work for morning or sunset sessions. View more images of my maternity session at Ironwoods by clicking here. View more images of my family photo session at Ironwoods by clicking here. The Winters family had fun on DT Fleming Beach for their morning family photo session, a popular spot and time for families with young children. Fleming Beach is another favorite of mine on the westside. Because it is so far north, the sun does not set directly behind this beach. Sunset sessions can still be beautiful here, though, especially if there are clouds in the sky that light up nicely at that time. There is a beautiful lava wall on the left side of this beach, and on the right there is some beautiful foliage and lava rock. The colors at this beach are spectacular during the day. There are bathrooms and a shower for rinsing the feet. There is also plenty of parking here. *This beach is recommended for a morning session but can also work at sunset. I’ve made some beautiful sunset images from this spot. Click here to view my morning family session at DT Fleming Beach. This newly engaged couple chose DT Fleming Beach for engagement photos. The sun doesn’t set directly behind this beach, but you can still get some beautiful skies here! Polo Beach in Wailea is a beautiful spot for a sunset family photo session because of the tall palm trees, lava rock and position of the sun. It’s always behind you at this location! Polo Beach is located behind the Fairmont Kea Lani Resort and Polo Beach Club condos. This beach is great for a sunset session as the sun always sets directly behind it. There are not as many backdrop options as Po’olenalena Beach, but it is still a beautiful beach with some good photo opps. There is some lava rock, palm trees and some foliage that work nicely in photos. If you are wanting to do a photo session in Wailea, Po’olenalena Beach is my preferred option, but Polo beach works fine if you are staying close by, do not want to travel far for your session or if someone in your group has mobility limitations. There is a large parking lot and bathroom facilities as this location. There is also a shower for rinsing the feet afterwards. *This beach is recommended for sunset sessions but a morning session can work nicely here, too, if scheduled early enough. Click here to view my sunset family photo session at Polo Beach.